CNN Geek Out: Obviously you've received a big response once again for this video. Harley: Well, it turns out people enjoy watching animals with lightsabers, what can I say? CNN Geek Out: What inspired it (besides "Star Wars" geekery of course)? Harley: I have about a half-dozen California redwoods in my backyard and they're overpopulated with squirrels. One day I spotted a particular little fellow behaving rather strangely, erratically jumping through the air for seemingly no reason. I whipped out my video camera to record some of the action, but it wasn't until a week later that my younger brother gave me the idea to insert lightsabers. Harley: If you've seen "Attack of the Clones," you've seen Yoda's particular style of swordplay. After making this video, all I can conclude is that perhaps some ILM animators found inspiration in Californian squirrels as well. I apperiacte you taking to time to contribute That\'s very helpful. Hilarious! I love Star Trak. This is a complete rip-off of the Jedi Cats video's on Youtube..
Are you silly or what! This isn't from Star Trek haha! It's from the Brady Bunch! 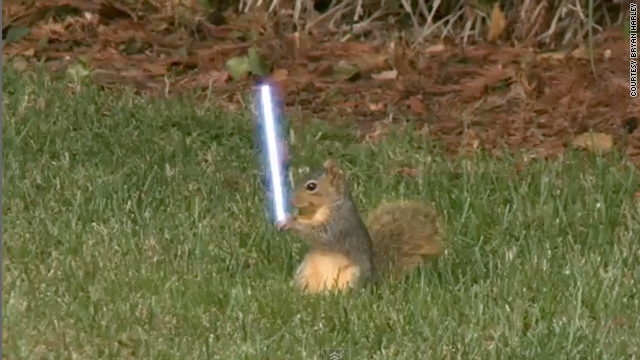 Sure squirrels are cute but add lightsabers and you have a golden goose right there. I think that all squirrels may be mentally disturbed though the way he fights with nothingness. Please tell me that no squirrels were hurt during the filming of this video. some futs were nucked during the shooting of this video. they were completely nucked up beyond all recognition. Hey CNN GEEK Out, did you even bother to preview last weeks video imbedded in the last frame before putting this on your CNN Website as a Feature. Seems you've been trolled. Hey any of our sons and daughters still being killed in the middle-east CNN. I just wanted to check since it appears there isn't more important grown up news out there. Maybe after you are done complaining about how they have a cartoon section in todays paper. Hey Robin In this time of financial chaos, mass unemployment, needless killing and people getting angrier in general I don't think a little squirrel humor is out of line. Afghanistan (and Iraq) are not Vietnam. In terms of percentage of our troops who have died, it's safer over there than it is over here. Our soldiers are more likely to be killed in a car accident, or, unfortunately, commit suicide over being jilted by someone they love, than they are to be struck by a bullet in Afghanistan. Those are the facts. As an Air Force veteran who served our country for 7 years, the majority of which was during both Iraq and Afghanistan, and who continues to serve in a civilian capacity after my back injury, I'd kindly ask you to leave us out of your politics and let us do our jobs... the jobs we volunteered for, knowing the consequences. It's much easier to finish up and come home when we're done if we don't have people trying to bring us home before our work is finished. Hear Hear. Nobody listens to reason-they just want to shout and complain to verify their existence. I'm probably headed to Afghanistan after college(Rangers if I qualify), but I hope the military isn't as plagued by bureaucracy like my college(and the rest of civilian life)seems to be. How dare Mr.Harley attempt to provide levity and entertainment at no charge! He should be shot. How the hell does this qualify as front page news? how the hell did lucas manage to rake in millions and millions of dollars even today based on only six films and half of which were quite crappy? Wow. This is some old stuff man. Who sells seashells down by the sea shore? Are there squirrels that give head? Please stop posting here, Mr. Sandusky. it sounds like someone wants his nuts cracked... with FORCE! Now we know how the $260K that Kentuckian Senator gave to the squirrel sanctuary was spent. This was the lamest thing I ever saw. cheer up, you need to. "Don't touch that squirrel's nuts. It'll make him crazy." You are an idiot of the worst kind! This was obviously stuck to this poor animals paw. You should be fined big time for cruelty to animals. Grow up. I hope you are joking.... really, i do. If you aren't – I can assure you that he added the lightsabre effect with After Effects. YOU are an idiot – the article clearly states the video was EDITED to make it look like the squirrel was holding a light saber. Have you ever heard of computers? Digital animation? Rotoscoping? Geez, that's just sad. I really hope you were being sarcastic...you're giving Kathy(s) everywhere a bad rap. To all the negative replier's, welcome to Idiot Village. you shouldn't even be allowed to comment. FYI, even in the original 3 star wars movies (ep 4, 5, and 6), the light-sabers were added later onto the film – this is called film editing, and it didn't even need a computer. Squirrel Wars, Revenge of the Blue Jay. today was but with bridge to another county and then some. Fun enough, but not terribly original. I've had that old inspiration poster-style Jedi Squirrels pic, depicting a three-way Sith/Jedi fight and a hilarious, but unrepeatable caption written beneath, set as an old iMac's desktop at home for something like six years now. I'm guessing the poor squirrelly ran into fire ants or something similar. Still, it's funny. I am trapped in a 2006 bubble? I liked Jedi Cats more but this was still very funny. Return of the Jedi Kittens! No it is an epic win, you're just a killjoy.